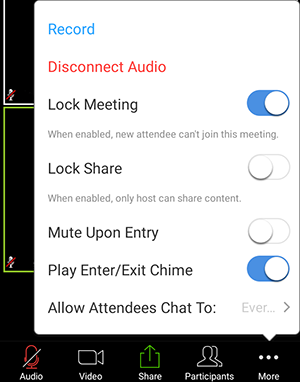 The co-host feature allows the host to share hosting privileges with another user, allowing the co-host to manage the administrative side of the meeting, such as managing participants or starting/stopping the recording. The host must assign a co-host during the webinar as it can't be assigned ahead of time. There is no limitation on the number of co-hosts you can have in a meeting or webinar. The co-host controls appear at the bottom of your screen if you're not currently screen sharing. Manage Participants: Open the Participants window where you will have access to enable or disable these options from the More menu. Stop Video: Click the video icon to stop a participant's video stream so they are unable to start their video. If the participant hasn't started their video, you will see the Ask to Start Video option. Polls: Launch polls created by the host. Co-hosts can't create new polls or edit existing ones. Learn more about meeting polling. Share: Start a screen share. You can select the desktop or application you want to share. Learn more about screen sharing. Screen share controls (click the ^ next to Share): Select how many participants can share at the same time and who can share. Co-hosts do not have permission to control who can start sharing when someone else is sharing. Chat: Access the chat window to chat with participants. Learn more about in-meeting chat. Record: Start a cloud or local recording. While recording, you can pause or stop the recording. Learn more about local recording and cloud recording. Leave Meeting: Leave the meeting while it's still in progress. The meeting will continue since co-hosts don't have the ability to end the meeting. When you are screen sharing, the controls appear in a moveable bar at the top or bottom of your screen depending where it is docked. You can click and drag to move it. 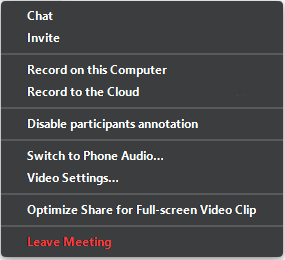 If you don't see the controls, hover over the green-highlighted meeting ID to display it. More: Find additional options for chat, video and audio. Disable participants annotation: Prevent the participants from being able to annotate on your screen share. Note for Mac users: MacBook Pro models with Touch Bar can also use the Touch Bar meeting controls. Learn more. The co-host controls appear at the bottom of your screen. 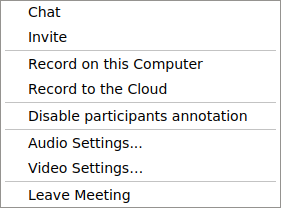 In the Zoom Web Client, co-hosts have access to the same controls as the host. Learn more. On an iPhone, the co-host controls appear at the bottom of your screen, except for Leave meeting which appears in the top-right corner. On iPad, they appear at the top of your screen. Share Content: Start a screen share. You'll be able to select what you would like to share. Learn more about screen sharing. Participants: Co-hosts have access to view and manage the participants, but can't put participants in a waiting room. More: Find additional settings available by tapping More. Record to the Cloud: Start a cloud recording. Read more about cloud recording. Disconnect Audio: Disconnect your audio to join the audio a different way. Advanced Settings: Additional settings are available by tapping Advanced Settings. Lock Meeting: Prevent new participants from joining the meeting. Lock Share: Prevent anyone except the host from sharing content. Mute on Entry: Mute all participants when they join. Play Enter / Exit Chime: Play a chime when new participants join. 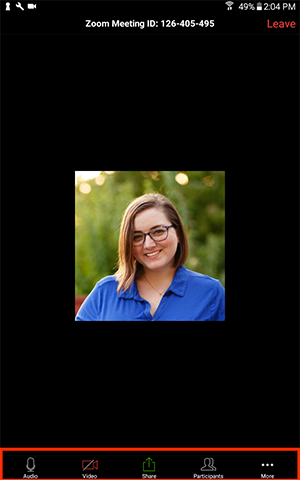 Allow Attendees to Chat with: Control who attendees can chat with. Read more about chat control. Leave: Leave the meeting while it's still in progress. The meeting will still continue since co-hosts don't have the ability to end the meeting. Share: Start a screen share. You'll be able to select what you want to share. Learn more about screen sharing. More: Find additional settings available under More. Record: Start a cloud recording. Read more about cloud recording. Mute Upon Entry: Mute all participants when they join. Allow Attendees Chat To: Control who attendees can chat with. Read more about chat control.